Yamaha introduces 2018 midrange AV amplifier range | What Hi-Fi? The three-strong RX-V85 line-up supports Yamaha’s MusicCast multi-room streaming platform and Amazon Alexa voice control. Yamaha has unveiled three new midrange RX AV amplifiers for the UK market: the RX-V485 (£450), RX-V585 (£550) and RX-V685 (£650) – all of which come with impressive specs. Wi-fi and Yamaha’s MusicCast network streaming platform allows streaming from services such as Spotify, Tidal, Qobuz and Deezer. It can also play PCM files up to 24-bit/192kHz over DLNA, and has multi-room functionality. Bluetooth, AirPlay and FM/AM radio tuners are also onboard, and owners of an Amazon Alexa speaker (such as the Echo, Echo Plus or Echo Spot) can control the amps’ volume or music playback simply by using their voice. Yamaha’s new MusicCast 20 (£230) and MusicCast 50 (£500) wi-fi speakers can be used as wireless surround channels, too. Using sound field data from various concert halls and music clubs, Yamaha has created several proprietary Cinema DSP 3D processing modes. Its Virtual Presence Speaker function also works to create a soundfield of extra channels to enhance width and height. eARC (Enhanced Audio Return Channel), which allows your TV to directly pass DTS:X and Dolby Atmos soundtracks to your audio system, will also be available via a future update. 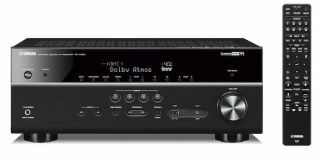 While the bottom-ranging RX-V485 (£450) is a 5.1-channel, 80W per channel amplifier, the RX-V585 and RX-V685 are 7.2-channel amplifiers with Dolby Atmos and DTS:X. That means they can be used in a 5.1.2 speaker set-up with ceiling or up-firing speakers. The 80W-per-channel RX-V585 has four HDMI inputs and a second subwoofer output, while the RX-V685 has a fifth HDMI input, a second HDMI output for running a second TV or projector, and a phono input for hooking up a turntable. The RX-V685 also has some additional features, including YPAO room calibration. YPAO Volume works to automatically adjust high and low frequency levels for improved low level listening, while YPAO Reflected Sound Control corrects sound reflections from walls, floor and ceilings. The RX-V685 also benefits from a new user interface with simplified operation menus and faster navigation. It also comes with a new, slimline remote. The RX-V485 (£450), RX-V585 (£550) and RX-V685 (£650) AV amplifiers will be available in the UK in the summer. Last but not least is a slimline model, the RX-S602 (above), priced £599, which replaces the RX-S601 being discontinued in May. Like its predecessor, the RX-S602 is a 5.1-channel network receiver, but has MusicCast, as well as Bluetooth and DAB/DAB+ radio tuners. It also features Alexa voice control and Cinema DSP 3D processing, and can be used with Yamaha’s wireless speakers as surround channels. Details of the brand’s top-end Aventage range are so far under wraps, but we hope to be able to bring you more information soon.